Tides of a Teardrop, the recent release from North Carolina folk duo Mandolin Orange, renders a sentimental and spiritual affinity. The sixth studio album finds Andrew Marlin and Emily Frantz returning to ineffaceable gentle and placid meditations. Ruminating on grief, spirituality, and inquietude, the album creates expanses of comfort. At full length, Mandolin Orange centralizes empathy and connection as Tides of a Teardrop radiates revivifying mindfulness. Tides of a Teardrop revels in reciprocity. Mandolin Orange's reliance on exchange is apparent in the album's lyrics. "Golden Embers" showcases the need for emotional uplift especially when an individual is incapable of mending their own heartache. In the chorus, Marlin sings "If you could help me to share the trouble / But you got burned and then you, then you can help me." A similar sentiment is expressed in "Time We Made Time". The duo reflects on the exchange between community and restoration as cardinal: "And in our time together / It's time we made time just for talking / It's time we made time to heal." These two tracks encapsulate the belief in giving freely without the expectation of return. As it indulges in reciprocity, Tides of a Teardrop is also ensconced in bitterness. The album's address of solitude in the wake of a loss is unequivocally genuine. "Lonely All the Time" reflects the pain associated with recollection: "a time when I was able / To sit down at the table / With the ones that I love most in life / Now my days have grown so bitter/ Lord knows they get no better." With beatific harmonies, Mandolin Orange's strength is their ability to soften an acute sting. As the track progresses, the lyrics transform to further develop the narrator's character. Here, vulnerability underscores resentment: "No glamour and no gold / Just give me someone dear to hold / When the nights have grown so cold and I haven't got a dime." Each track on Tides of Teardrop deftly illustrates emotional multiplicity despite the seeming disparateness between joy and sorrow. Beyond affective synchrony, Mandolin Orange also demonstrates an intricate aural network created by simple instrumentation. 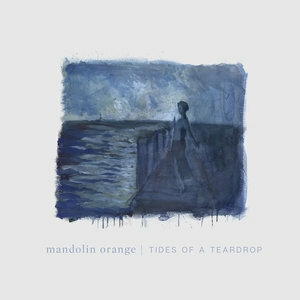 As recognized in previous releases, Tides of a Teardrop showcases Frantz's guitar and Marlin's mandolin while exchanging vocal leads. However, Tides of a Teardrop finds Mandolin Orange pushing the confines of their musicality. For this album, the duo enlisted their touring band to form a rich and palatable sonic tapestry. For example, the instrumentation in "The Wolves" recreates the sound of the animal's howl. Marlin's mandolin evokes a chilling undercurrent juxtaposed to the duo's typical warmth. While the strings in "Time We Made Time" are decadent and the upsurge captures emotive progression. The cacophony in the track's final moments suggests advancement is not always smooth. Yet the resolution's unfurling reminds that emotional growth is still possible despite moments of unrest.